I always feel slightly bad when F’s eyes light up with glee when he hears or sees a fire truck. Nee-nah-nee-nah-nee-nah! I’m sure it’s perfectly normal (he’s only 28 months old) but I can’t help thinking about the emergency that the truck is rushing to. I decided to gently introduce him to the concept that fire trucks do more than produce sirens and flashing lights. F painted a page from our Melissa a & Doug Paint with Water book. I painted F’s foot red and made a print from it. 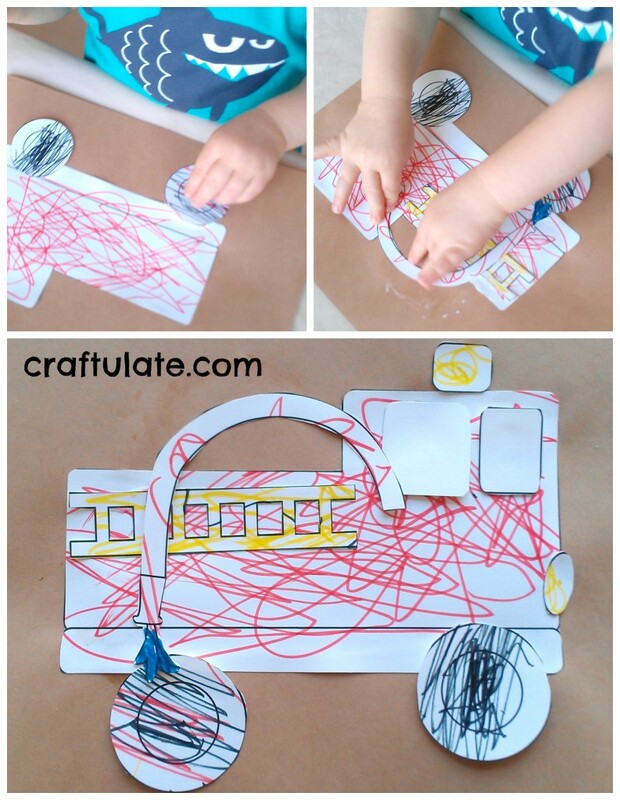 It wasn’t the clearest print but it still made a fun fire truck, as inspired by Sweet and Lovely Crafts. 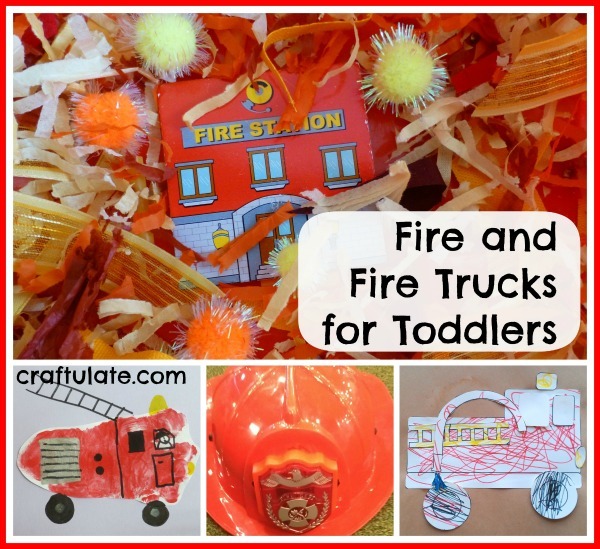 I downloaded this great fire truck craft from Learn Create Love (we have made loads of crafts from here – we did four of them for our Construction Site Themed Room!). I worked with F to help him colour the correct parts of the truck with the right colour. He mostly got it right! 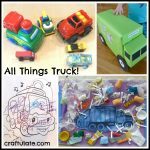 The I cut out the pieces, and glued the main truck piece onto some construction paper. I helped F with the positioning of some of the pieces, but I left some (like the wheels and hose) completely up to him! 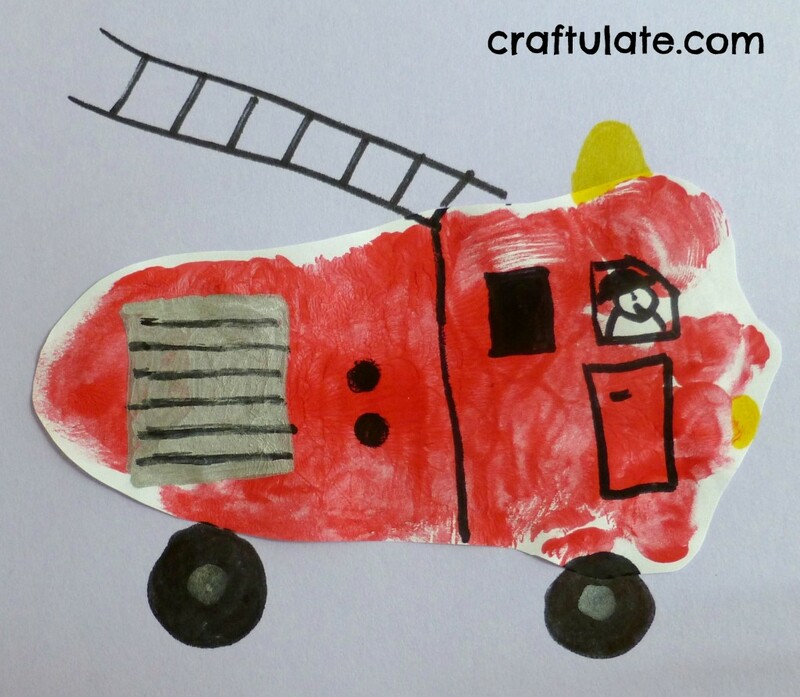 I love papercraft and couldn’t resist making this cute little paper fire truck for F from Canon Creative Park. The ladder rotates, tips, and even extends! F was really gentle with it! I love how the colours were so bright and vibrant! The Shimmer Poms had been sent to me by CraftProjectIdeas.com as part of a bundle of craft supplies to try out. 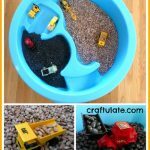 They were absolutely perfect for this sensory bin! 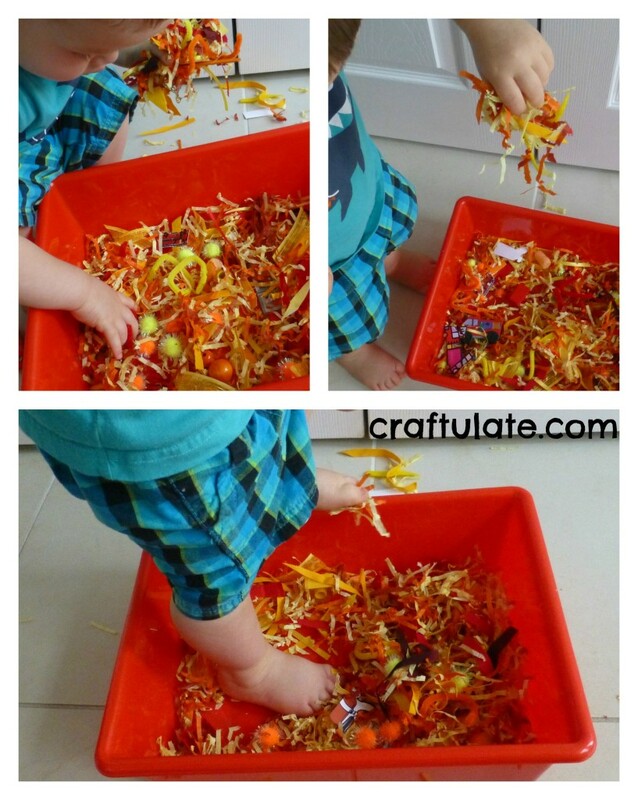 The next day we played with this again, but made a mess this time by running our fingers through the paper and fabric and dropping them from a height! He even got a sensory foot experience! We didn’t quite manage to complete this activity as F was slightly… um… reluctant. At a play cafe I found a firefighter’s outfit and showed him the hat. But he wouldn’t wear it! We went to our nearest fire station and looked at the fire trucks which look VERY big close up! A fireman came over to say hello and said they were cleaning but we could look around if we would like. I couldn’t take many photos as I was running after F, but we saw the fireman’s pole, ladders and two trucks. This app has many options but is mainly an interactive story. F is just about getting into the story but the app also offers two games (one letters, one numbers) which he LOVES! This is F’s go-to app right now. The fire truck needs to be guided around the town, and the user helps to put out fires, rescue cats, and refill the tanker with water. It also offers some great practical advice like how to dial 911, and how to Stop, Drop, Roll. I downloaded this app but haven’t given it to F yet as I think he is too young for it. But the graphics look great and the game options include finding items on the truck, squirting water to put out a fire, and driving the fire truck. Please see here for some guidelines from the USFA for preparing, practicing and preventing a fire. 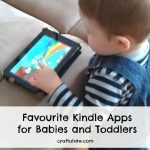 Also see here for their free kid’s activities book.